but please read on so you can learn more and plan your spring, summer or fall visit!! The trees of the Ancient Bristlecone Pine Forest in the White Mountains roughly an hour’s drive to the east of Bishop are the oldest recorded living thing on earth. A millennium older than the Giant Sequoia trees in the nearby Sierra, many are well over 2,000 years old and the “Methuselah” tree in Schulman Grove is dated at more than 4,773 years old. These trees were young and growing at the time stone axes were being used in Europe, the Great Pyramid of Khufu (Cheops) was being built, and cuneiform clay tablets were being used in northern Syria. Bristlecone pines (Pinus longaeva & aristata) grow in the White Mountains at elevations 9,000 to over 11,000 feet. The oldest trees grow on outcrops of dolomite, an alkaline calcareous, low nutrient soil. Only on the alkaline dolomite will you find pure, relatively dense stands of Bristlecone pine. Adventurous travelers can embark on this ridge line road that rises to over 11,000 feet above sea level. A keen observer will notice the changes in the environment that come with climbing to such elevations. Desert surrounds you as you start the tour, but soon changes to a Pinyon-Juniper Woodland before entering the realm of the Ancient Bristlecone Pine Forest. When gazing at the twisted trunks and weathered bark of the Bristlecone Pines, the traveler may just be looking at something that has been growing for almost 5 millennium. Try to imagine the time when one of these gnarled ancients was just a seedling is unfathomable. 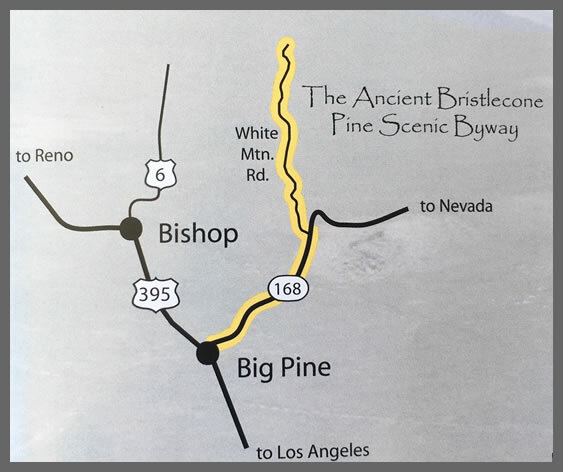 The history, science and unique location of the Bristlecone forest is a wonderful excursion and we encourage you to take this trip. The U.S. Forest Service has established a visitors center at the Schulman Grove. Closed during the winter, due to snow, the forest and visitors center are open generally from May through mid-November. Call the White Mountain Ranger station in Bishop for more information, road conditions and hours (760) 873-2500. To reach the Bristlecones, from Bishop travel south for 14 miles on Hwy. 395 to Big Pine then follow Hwy. 168 east into the mountains for another 26 miles to the Ancient Bristlecone Pine Forest National Scenic Byway. Make sure to get gas in Bishop or Big Pine, as there are no gas stations at the Bristlecones. Plan for a 1 hour to 1 1/4 hour trip each way, as you will encounter a steep winding road with awe inspiring vistas of the Eastern High Sierra range you will want to stop and take in. The more adventurous with high clearance four wheel drive vehicles can take the rugged Silver Canyon Road out of Bishop (Laws area) 15 miles up to the Bristlecones. Take your time and enjoy the views!! Stay in your lane. There are many blind curves and opposing traffic comes when least expected. Use low gears when going down steep grades and only use brakes intermittently. Use the many pullouts when faster drivers are behind you. Cell phone reception is limited. Motor homes are not advised to take the road past the Schulman Grove.